A very special "thank you" to Monsignor Walter Nolan, for his priesthood, for his long-term hosting of Catholic Corner, and for his questions and gentle moderating of this interview. 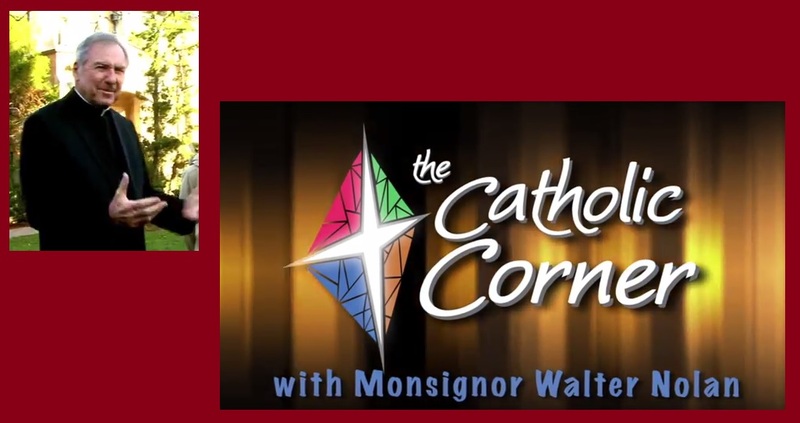 Happy to share my story, but recognize that every priest has an extraordinary story and path to their vocation. I am grateful this Thanksgiving for my brother priests, my brother the priest, and my sons, family and all those friends who helped shape my priesthood. I will often walk through our parish cemetery, reciting the Rosary. It is an incredibly peaceful place, and no matter what or who my intentions are for, it just seems particularly comfortable to journey among the graves of those long departed, and among those who are recently gone from this life on earth. It is holy ground, which makes it a good place to pray. Mount Carmel Cemetery is also very convenient, since it is right outside my front door, and I can walk across my driveway and I am in the "Old Section," as we call it; several graves here date from the 1800s. This is also the cemetery where my wife is interred, and where one day I will be buried beside her, or as my son remarked when I was assigned to OLGC, "How do you feel starting out your priesthood where you will also end it?" Ah, Irish humor in the midst of a graveyard; who would have thought! Today, however, my walk and prayers were for others. With my cheat sheet in hand, I was praying for those Faithful Departed who where buried here more than 100 years ago. I would like to believe that they are in heaven, and could join in my intercessions on this Feast of All Souls, along with the whole Communion of Saints. But my wanderings today also seemed to draw me into closely studying those older, perhaps "ancient" graves, to consider their stories and lives. 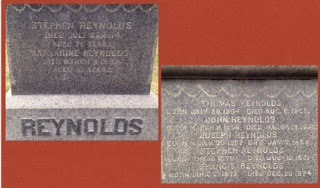 There is the Reynolds family, Stephen buried in 1914 at the age of 78, twenty-two years after his wife Catharine. On the back of that same stone, however, are inscribed the names of their five sons, who died between 1866 and 1874, none more than 2-years-old. That is a family who knew pain, who knew the emotional struggle of grief. May their souls rest in peace! There is Margaret Taylor, whose death in 1899 was marked as being when she was "21 years, 3 months, and 6 days old." Young by our standards today, and by those in the 19th century. 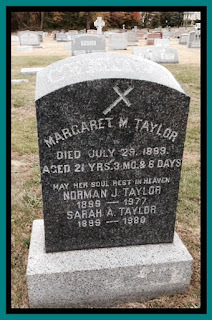 Curiously, beneath her name are the names of Norman and Sarah Taylor, both born in 1899, and who lived for 78 and 81 years beyond Margaret. Were they husband and wife? Twins? More poignantly, did Margaret die in childbirth in 1899, the same year these other two were born? May they rest in peace together. Then there is William Cunningham, born February 8, 1910, and died February 9, 1910. This child who lived for only a day has the dates of his short life etched on the side of the grave marker for Mary Cunningham, who died on February 15, 1910 at the age of 34. 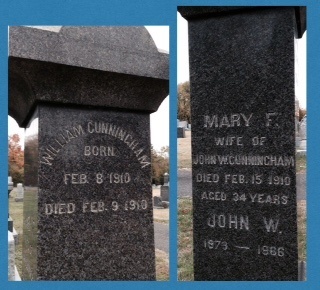 Mary clearly died in the days following the birth and short life of her son William, and their journey to heaven was most certainly a time of deep grief for John W. Cunningham, who would live another 56 years until 1966. May they rest in eternal peace together. It is good to pray for those who have gone before us, to remember those who have been called already to the fullness of life in heaven. At Mass this morning, I noted numerous parents, spouses, and children who have buried a loved one since this past June, when I began to understand more deeply what it means to minister to the dying and to grief-stricken families. Remembering loved ones is hard, regardless of whether they were lost at 1 day, two years, 26 years, 28 years, 49 years, or 92 years. They are loved, and they are missed. But praying for their souls on this feast day, while wandering through this ancient (to me) cemetery, was comforting. All of this earth is sacred ground; all the days of our lives are sacred moments, gifts from a Creator who desires each of us to one day be embraced again in His arms in heaven. Thank you, Jesus, for the gift of loved ones who are part of our lives, no matter how many days or years we spend with them; they are gifts to us, just as they are gifts from the Father to the Son, who cherishes each one as His Beloved Sons and Daughters. May their souls, and the souls of all the faithful departed, rest in peace. As we pray in our Eucharistic Prayer, "To our departed brothers and sisters, too, and to all who were pleasing to You at their passing from this life, give kind admittance to Your kingdom. There we hope to enjoy forever the fullness of Your glory."